It’s been something of a middling year for Warner Bros. Sure, Mad Max blazed his way down the Fury Road and into Box Office Valhalla (driving sales of silver spray paint and bright red pajamas along the way), and the studio’s Black Mass helped remind movie-goers that Johnny Depp is more than just the sum of his mustaches, hats, and inadvisable quirks. But audiences yawned their way past the spy shenanigans of The Man From U.N.C.L.E., while Pan vanished from theaters faster than Tinkerbell at a convention for people who like to say they don’t believe in fairies. Batman V Superman star Ben Affleck seems to think his upcoming superhero throwdown might just turn the company’s fortunes around, though. Talking to Variety, the future superhero discussed the attendant pressures of having to give his all to save dozens of people—i.e., all the Warner Bros. executives who are going to get fired really, really fast if the company’s billion-dollar effort to build a DC Comics movie franchise doesn’t work. 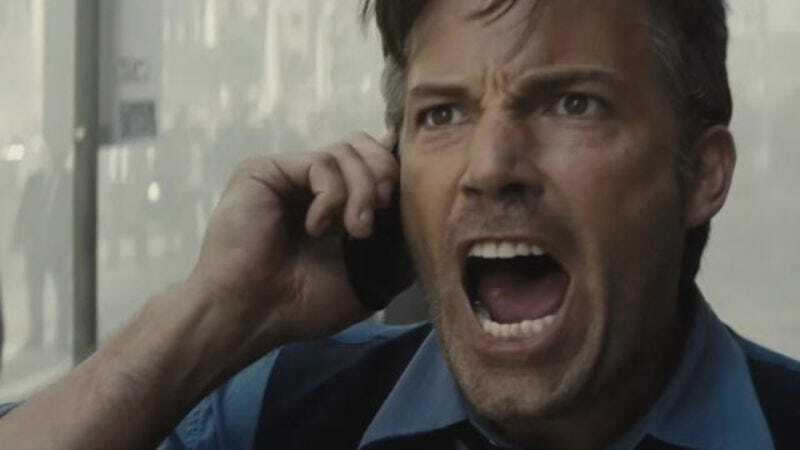 Anyway, we’re keeping our fingers crossed that Ben Affleck doesn’t have too many more sleepless nights worrying over the fate of poor old Warner Bros. (or, heaven forbid, that the studio somehow fails, sending him on a lifelong crusade to stop something like this from ever happening again.) Someone should probably be nice and remind him that Batman V Superman is going to be so massively over-promoted by the time that it comes out on March 25 that it’ll probably bring in at least a billion at the box office, even if it just turns out to be footage of a pair of hefty teenagers in homemade costumes punching each other and making the sound effects with their mouths.